Having some spare time, I’ve taken the opportunity to try and progress the development of my own RPG system, Beta. As I mentioned in my last post, this is a long-overdue project and it’s nice to be finally working on it in earnest. All of these elements mean that I’m almost ready to inflict the system on my alpha-team of players. Although anyone can access the wiki and view our progress, I’m hoping to initially set up a small game with a couple of players (probably using Roll20.net). The aim will be to see if any of this nonsense actually works. For years, I’ve been wrestling with how to use Dice Pools to quickly assess the success of an action without giving myself a serious headache. I’ve tried with d12, d8 and d6. Each time, the problem was that no one die roll gives enough of a range to emulate the effects desired. In truth, the breakthrough came when I realised that I could combine the concepts behind the luscious polyhedral dice mechanics of the Cortex System with the symbol-dice created for the latest Star Wars system. Beta RPG is played using a selection of special Beta Dice. These are polyhedral dice bearing two types of symbol: wins and fails. When making a test the player will assemble a Dice Pool to roll. This is a collection of different dice types and colours based upon the abilities of the hero. Once assembled, the dice are rolled; fails are subtracted from wins, and the final result is announced to the GM. Wanting to start designing a character I realised that I needed something to record my decisions on. 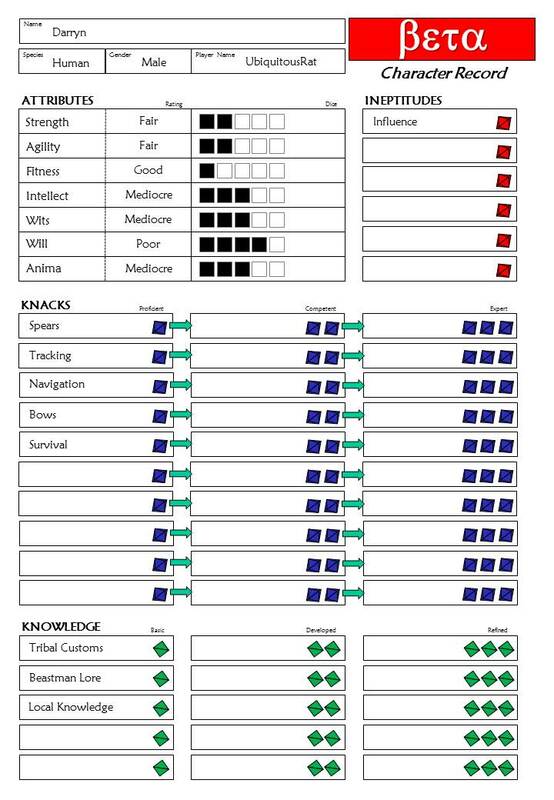 A couple of hours of design have resulted in the creation of the first sheet, designed to handle Attributes, Knacks, Ineptitudes and Knowledges. I’ll need to expand it… but first things first, as they say. Once that lot was out of the way I decided to begin prepping for some playtesting. As a starting point for playtesting Beta RPG it makes sense to begin with a relatively simple setting. Mykovnia is my own fantasy world. It was born some 28 or so years ago, when I was a young aspiring gamer. It was a place of dark fantasy and night terrors. Mykovnia is a gritty fantasy, suitable for swords-and-sorcery style play. Despite recent attempts, the world has never been accurately modelled with an RPG system because things never seemed to feel quite… right. Now is the time. Having recently started to model a couple of characters in the setting using the RuneQuest 6th Edition rules, I decided to look at converting one of them over. Enter Darryn. You can read about his genesis in my review article for RQ6 at The Iron Tavern. Darryn is a tribal hunter from a group of Humans living just south of a bitter arctic tundra. He is a somewhat dour and serious fellow, trained in the arts of the Wolf Hunt – a form of ritual – and marked as being under the gaze of the Moon Queen. Using the draft Character Creation rules I converted him over to Beta in about 5 minutes. He still needs an Edge and a Flaw, but then I need to design some rules for those too. All in all, I’m really excited to be rolling hot with the system. I’m sure that my ego will crash mightily the minute that anyone reading decides to point out my glaring errors, but in the meantime it feels good to be finally writing something fresh. Ego aside, though, don’t be hesitant to comment. If you spot a glaring error then it’s better to bruise my fragile ego than to leave it there… glaring… staring, like the proverbial Beholder. What’s next? Well… giving Darryn an Edge and a Flaw for starters. Then it’s time to create Shanna, the shaman’s apprentice. And you know what I’ll need to write to make her playable, right?